You may have seen that earlier this week I posted my recipe for a Roast Pork with Apples and Cider Gravy. Along with the recipe, I shared some of my top tips for serving up your roast on time without any burnt parsnips or undercooked carrots. As good as that recipe is (and boy is it good) a Sunday roast just isn’t complete without a pudding, and not just any pudding but a trifle! What goes into a trifle? Sponge soaked in alcohol or fruit juice. You’ll find the odd recipe with jelly but this is really a matter of taste. 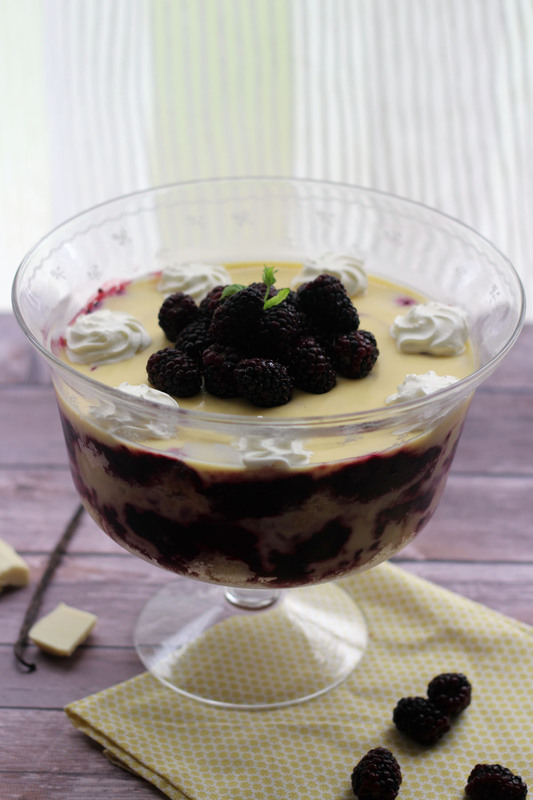 To celebrate the British-ness of this dessert, I decided to use blackberries as the fruit of choice in this imaginatively named “Blackberry Trifle”. I have fond memories of picking blackberries from hedgerows around my home town and while away on holidays to Cornwall and Devon. If I happen to come across a blackberry bush even now I’m likely to stop to pick a few! 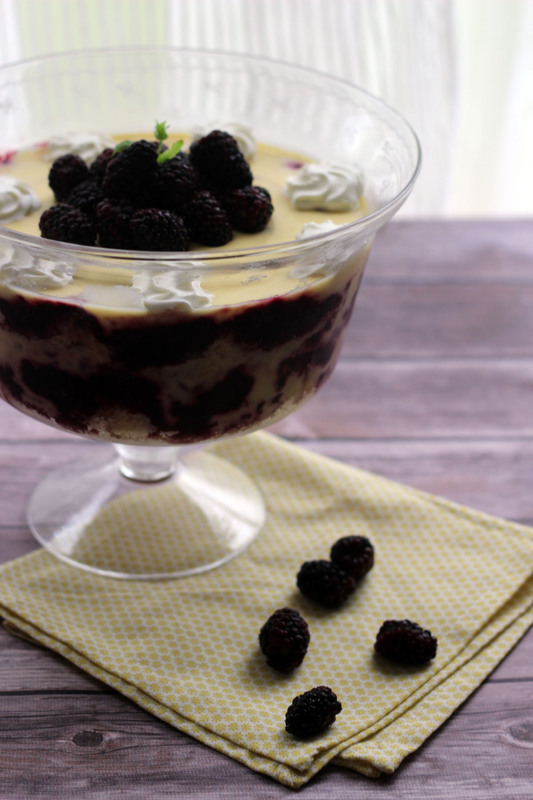 I like to think of this Blackberry Trifle as a grown up desert. Not only have I stuck with blackberries, flavoured with a hint of star anise, but I’ve also drenched the sponge layers in kirsch and black raspberry liqueur which adds an extra dimension to the dessert. Lastly, I’ve opted for extra lashings of thick white chocolate custard and just a few squirts of whipped cream to top it all off. 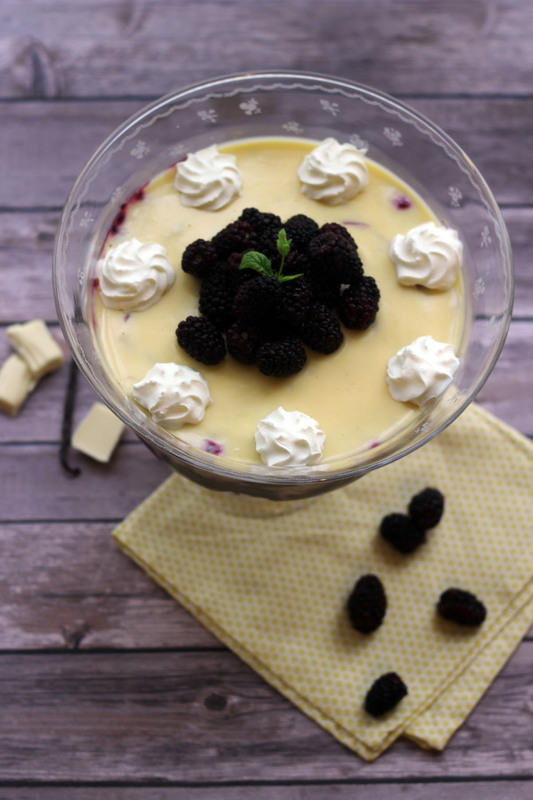 The fresh white chocolate custard makes this a really rich and decadent dessert but the blackberry with star anise compote cuts through this making it incredibly more-ish. I’ve stated that this recipe serves 6-8 but these are some pretty generous helpings! Bring your appetite! Begin by creaming together the egg yolks and caster sugar in a large bowl. Whisk for about 2-3 minutes (by hand is fine) until the mixture becomes pale, thick and creamy. It will also increase slightly in volume. Next, pour the milk and cream along with the seeds of the vanilla pod into a heavy bottomed saucepan and bring to the boil. Add a ladle full of the hot milk/cream to the egg yolk mix and whisk quickly ensuring the mix does not curdle. Add the rest of the milk/cream a ladle full at a time until fully combined. Pour the mix back into the sauce pan and cook over a moderate heat for another 5 minutes until the custard begins to thicken and coats the back of your spoon. Add in the white chocolate and stir until this has melted completely. You must allow the custard to cool completely before you can build the trifle so place this to one side. To make the blackberry compote, melt the knob of butter in a large pan on a low heat. Add the blackberries, sugar and star anise to the pan and cook for 5 minutes or until the fruit starts to soften and burst. Remove the star anise and place to one side to cool. Once both the custard and compote are cool you can begin to build the trifle. Begin by layering half of the sponge in the bottom of your trifle dish before spooning over half of the kirsch. Next, layer on top of the sponge half of the cooled blackberry compote followed by half of the custard. Repeat the sponge, kirsch, blackberry and custard layers for a second time and place in the fridge to set (ideally leave overnight). 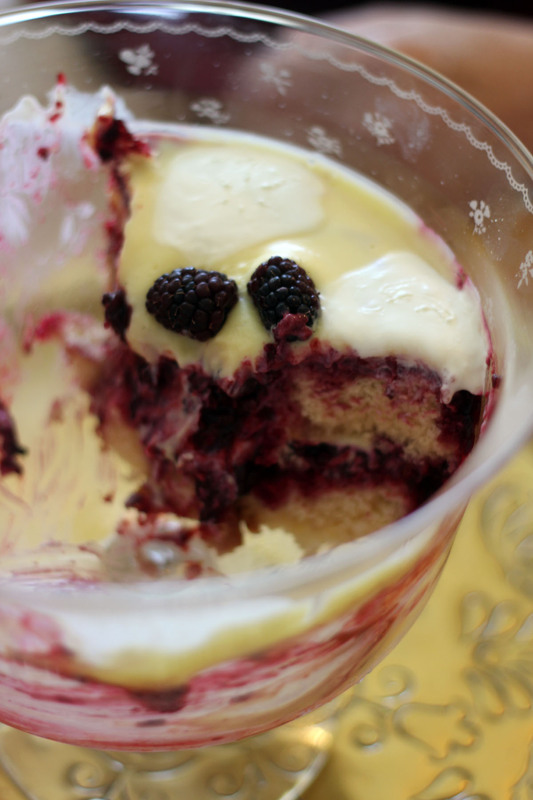 Before serving, decorate the trifle with some of the reserved blackberries and cream (whipped). Top with a sprig of mint and dive in! There are a couple of ways you can make life easier for yourself with this recipe. First, is not foraging for your own blackberries – just pick them up in store! If you can’t find fresh (or they are super pricey) opt for frozen berries, it shouldn’t affect the taste. Last but not least, don’t forget to take out the star anise! No one wants a broken tooth from eating trifle. Hopefully I’ve convinced you that trifle isn’t just an old fashioned pudding your Nan rolls out for special occasions. This updated version is seriously tasty and a real crowd pleaser! I do love a good trifle and yours looks excellent. I heartily approve of the white chocolate addition and the blackberries give a sophisticated touch. what a lovely trifle. I do love blackberries, their colour and floral sweetness. The sweet trifle layers are a perfect way to soften the acidity of them too! Yum, I especially like a pudding when it’s used in the same sentence as ‘generous helpings’! Sounds lovely. Haha thanks Jen. 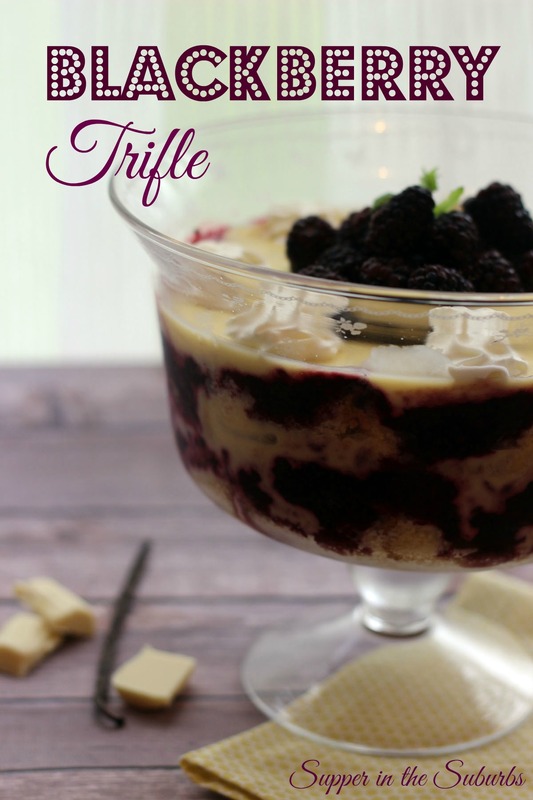 I don’t usually go for trifle either but this is a winning recipe! I love blueberries and this combination of custard and white chocolate and the naughty bit of liqueur is just too tempting! Thanks Helen. I think its important to celebrate seasonal produce in recipes like this! And thank you for including it!